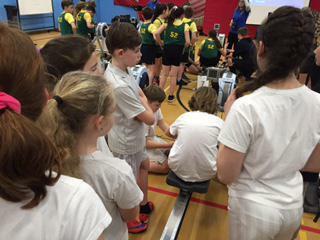 During January, Years 5 and 6 have been taking part in dry land rowing sessions as part of the sports provision we buy into which is offered by the Plymouth School Sports Partnership. 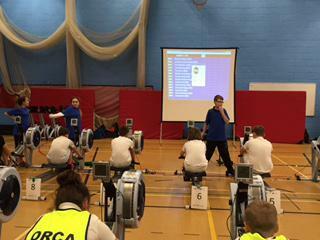 During these sessions, the fastest rowers were selected to represent Pomphlett in the Plymouth Schools competition. This took place on Thursday 28th January at Plymstock School. 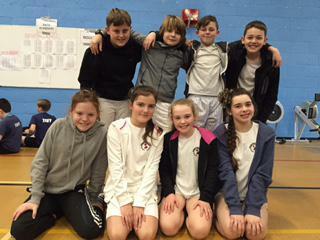 Our team of 8 Year 6s took part in two events, an individual timed row and the team row. There were some outstanding results in the individual events, where every competitor raced as fast as they could to get the furthest distance in 2 minutes (Harrison - 3rd, Morgan - 5th, Leah - 6th, Cleo - 9th) with all distances counting towards the team score. Next came the tricky team rowing relay. This involved all team members rowing consecutively for 30 seconds, each on one rowing machine to get the furthest distance they could in 4 minutes. Smooth transitions were essential and teamwork a necessity to get the result they wanted! Once all the scores were added up from the 43 school teams that had entered, Pomphlett had achieved an amazing 4th place - only 3m behind the bronze medal position! So close!!! We are incredibly proud of everyone involved as they showed sheer grit and determination and fantastic Pomphlett teamwork. Well done to all members of the team, which, as well as those children already mentioned above, Jack , Anthony, Lauren and Elissa !